Bayside Presbyterian offers you three opportunities to worship God on Sunday mornings: 8, 9 and 11 am. Each worship service is unique in style, but consistent in depth and teaching. Services typically last 45-60 minutes and involve singing and congregational participation. a blend of both traditional and contemporary styles. On the 1st Sunday of the Month, we worship as the Whole Family of God, with one service in the Sanctuary at 11 am. Communion is served at this service. There is no dress code. We believe that God desires the best from your heart, not necessarily your wardrobe. It is fine if you arrive in scrubs, uniform, or ready for the rest of your day. Bayside Presbyterian Church offers the sacrament of communion on the first Sunday of every month at the Whole Family of God service at 11 am. Communion is also offered on the 3rd Sunday of the month at the 8 am worship service and the 9 am "Sail On" service in the Fellowship Hall. We understand communion to be a gift from God and a sign of God's grace--a mystery to be revered and celebrated joyfully! One does not need to be a member of the church to take part in this celebration; all are welcome. In an effort to be sensitive to our community, the Cup that is offered is non-alcoholic grape juice. We LOVE kids! Children of all ages are given several opportunities to worship and engage in God's Word -- in worship services, and in the nurseries during our services. Kids learn faith by experience and by watching us; their inclusion with the congregation is important. We offer worship bags with lots of activities to keep little brains engaged. 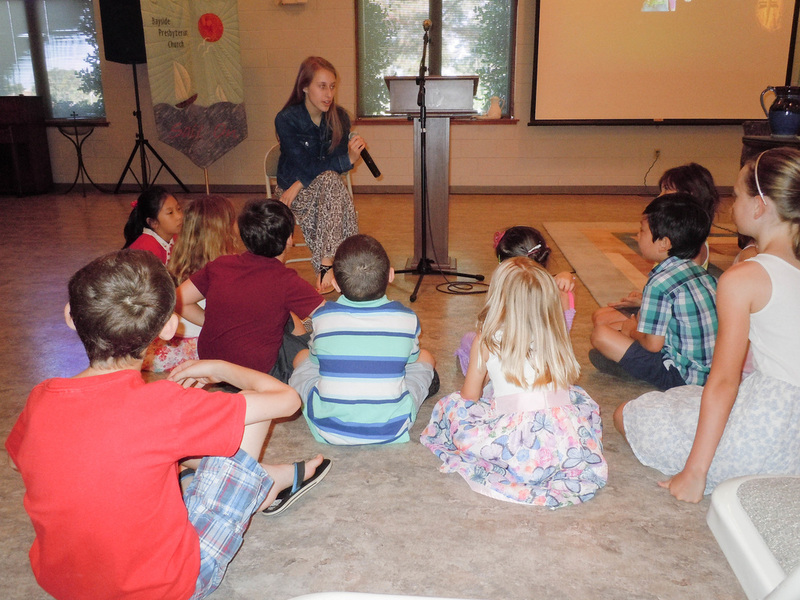 Older kids are encouraged to pick up a Worship Bingo Card, a children's bulletin and worship with their families. If, however, your family needs to worship separately, our child care rooms are available (infant-kindergarten) during all three services. Our child care rooms (Rooms 302 and 304) are staffed for all three services. They can accommodate infants through children who are presently in kindergarten. We have pagers available to parents in the event that you are needed during the service. Faith Inclusion Network: Bayside Presbyterian Church is part of FIN, the Faith Inclusion Network. As such, we are equipped to offer assistance and child care to children and/or adults needing special help. Click here for more information. Reservations must be made for this assistance. Hearing or Sight Impaired: Bayside provides large print hymnals, Bibles, and bulletins for those with vision impairment. We also offer headsets for the hearing impaired. Please ask the ushers for assistance. Parking: There is ample off-street parking in the main parking lots that are accessible from either Independence Blvd or Ewell Road. Both the Main entrance and the Ewell Road entrance are wheelchair-accessible with multiple Handicap Parking spaces. Welcome Desk: There is information provided on a wide variety of programs at our welcome desk in the Atrium.